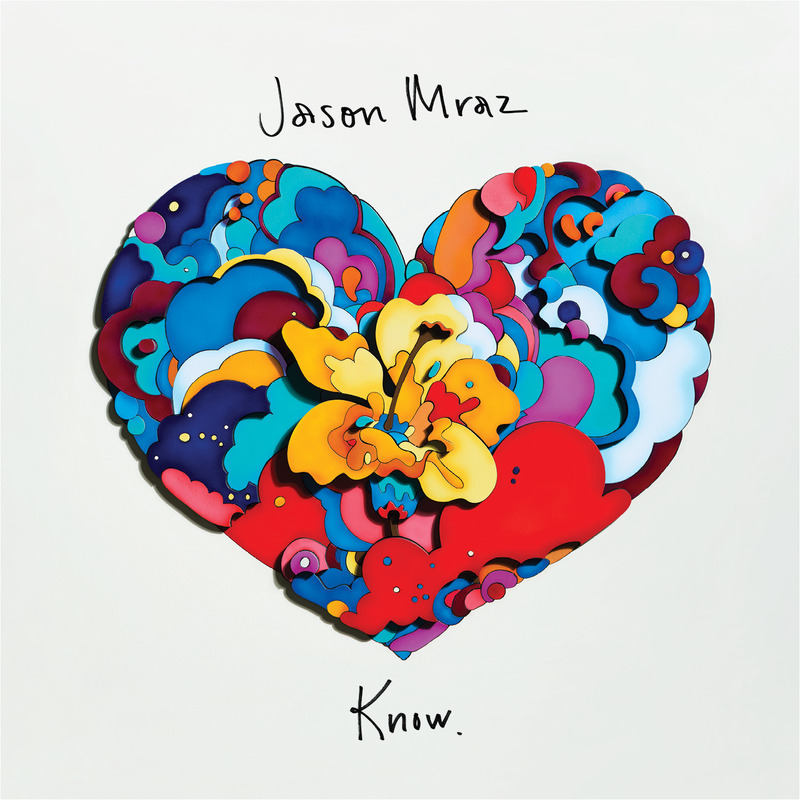 A source of warmth, light, and love, Jason Mraz’s sixth album ‘Know.’ spreads a positive and powerful message we can all rally around. Jason Mraz isn’t preaching love for love’s sake: He truly believes in his music’s message, and after listening to new album Know., you will too. The cleverly-titled follow-up to 2014’s Yes!, Know. (out 8/10/2018 via Atlantic Records) presents itself as an inviting source of warmth, light, and love. Jason Mraz has clearly found his calling in spreading positivity – he’s gone so far as to title his current tour Good Vibes – and we can think of no better ambassador for love, than this artist who has unabashedly embraced it over the past two decades. Released into a climate where tension, fear, and antipathy loom ominously overhead, Know. seems like Jason Mraz’s retaliation to darkness, with love as his potent weapon of choice. While he avoids directly addressing the cultural and political fights that have bubbled up to the surface in recent years, Mraz’s lyrics betray an internal struggle to stay the course. His songs find him searching for solutions to common problems and looking for ways to keep our heads held high. In his attempt to cope with life’s curveballs and find balance in chaos, Jason Mraz has crafted a universal anchor of light for all kinds of darkness. Opening track “Let’s See What the Night Can Do” begins the album by proposing ways to reconnect and keep the flame alive. “Let’s drive out to the desert at midnight, to dance in the dust of our headlights and score some good seats for the sunrise,” Mraz suggests in the first verse, earnestly trying to find a place of intimate unity and oneness. The chorus speaks to all who have felt neglected by their loved one: “I wanna get lost with you, and hide out, out under the light of the moon,” Mraz croons in his smooth tenor. A song full of resilient hope, “Let’s See What the Night Can Do” is the perfect entrance to a record that, taken in its entirety, feels more like a justification for, rather than a blithe celebration of love. For Mraz, love is far more than his artistic “niche”; it’s a mantra and a way of life. The 41-year-old singer/songwriter doubles down on this throughout Know., emphasizing life’s limitless possibilities in songs of hope, togetherness, affection, camaraderie, intimacy, and beyond. His infectious optimism is a grounding force; meanwhile, his colorful melodies and lyrical savvy keep us on our toes. “It could be love, and we could be homies,” he offers on the groovy “Unlonely,” “And once you get to know me, I could be your one and only, I could make you unlonely.” It’s an innocent, earnest offer to replace our darkness with light that just so happens to coin a new word in the process. Sung with absolute sincerity, “Unlonely” is the kind of song that makes you feel happy to be alive, whilst recognizing that life itself is far from perfect. But if we all did our part, this world could be a much better place. Mraz continues to be a shining inspiration on his sixth record, keeping things fresh while staying true to his troubadour sound – that engaging blend of folk, pop, rock, funk, and a drop of golden sunshine. Songs like “Making It Up” and “Might As Well Dance” relay messages learned later in life, whilst the beautiful “Sleeping to Dream,” a popular love song Mraz has played live for nearly twenty years, finally sees its studio release. To learn how to master peace or master war? This song shows Mraz to be not a head-in-the-clouds dreamer, but a cognizant artist who truly believes his own words. Jason Mraz is a man of faith: Faith in humanity, and faith in love. Each and every song on Know. has the uncanny ability to arouse warm, fuzzy feelings. While it can sometimes feel like a big, carefree party, the majority of Mraz’s sixth album maintains the ethos of an intimate soirée – a gathering of your closest friends, where you feel comfortable in your own skin and free to share your deepest thoughts and feelings. Know. is a safe space, a thoughtful feelgood environment that puts love on the pedestal, because it really matters. Love conquers; love cures; love frees; love lifts. Jason Mraz is not so naïve to think that love is the only thing in this world, but in a moment in history where hatred, bigotry and prejudice abound, love is worth embracing with open hearts and outstreched arms. Know. offers endless ray of warmth and cheer, so that no matter what you’re going through, you can turn to Jason Mraz’s music for healing and renewal. If you don’t believe me, give Jason Mraz a listen. He’ll convince you.